It was the motto for Richard Fitch, professor of chemistry at Indiana State University, as he applied multiple times over 10 years for a more than $236,000 grant from the National Science Foundation's Major Research Instrumentation program. The award funded the purchase a high-resolution liquid chromatograph-mass spectrometer that will aid in undergraduate research and better prepare biology and chemistry for graduate school and careers. "The first time we applied for the grant in 2006, we didn't get it," said Fitch, who successfully secured the grant in 2015. "The reviewers indicated we did not sufficiently justify the need for high resolution. When we applied the second time, we decided on a less expensive piece of equipment that was lower resolution but would allow us to get most of the information. When we put that in that proposal, we were told that we needed the higher resolution instrument. It was frustrating at times, but we didn't give up. Persistence eventually pays off." The spectrometer purchased with the grant was installed in the Science Building in December and in January and May chemistry and biology faculty participated in trainings on how to use the instrument. The spectrometer, Fitch said, will allow students and faculty to study cells by comparing the protein makeup of normal and abnormal cells to better understand the body and how it works. He also plans to use the instrument to aid in research on poison frogs - his personal research interest. He hopes the new device will provide students a rare opportunity to use a spectrometer in their undergraduate studies to precisely measure the weight of molecules out to four places after decimal point, which will help distinguish what a molecule is made of. "One of the most useful things a chemist can know about a molecule is its elemental composition, and this instrument will allow our students to do that," Fitch said. "We pride ourselves in the chemistry department with providing students hands-on experiences they will use in graduate school and on the job." The hurdles Fitch had to jump to secure the grant were worth the work to have the spectrometer. "Science is expensive but it merits the cost when you provide new research and quality training for students. This is the kind of instrument that you don't usually find outside of a large research institution," he said. "It is a real feather in our cap to have a high resolution mass spectrometer like this on campus." Since its installation, Fitch, who served as principal investigator for the grant, said two Indiana State students have so far learned to use the instrument, including Ashley Clodfelter who is looking at MRSA staph infection proteins with Kathleen Danelly, associate professor of biology, and Jake Pruett who is working with Diana Hews, professor of biology, on chemical compounds in lizard secretions that serve as communication signals. Collaborating with Fitch in securing the National Science Foundation grant for the spectrometer were Indiana State colleagues William Flurkey, Robert Noll, Diana Hews and Stephen Wolf. Faculty from outside Indiana State will also be able to use the device for research. 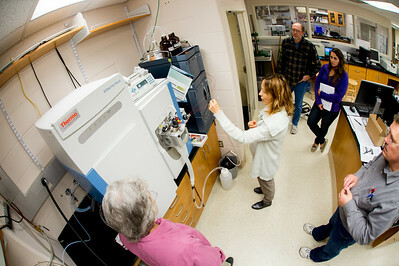 Photo: http://photos.indstate.edu/Other/Media-Services/Media-Sciences/Mass-Spectrometer-training/i-6xzZgKX/0/S/05_11_16_spectrometer-2260-S.jpg - Faculty take part in training at the Science Building in May to learn how to operate Indiana State's new high-resolution liquid chromatograph-mass spectrometer that was funded with a more than $236,000 grant from the National Science Foundation's Major Research Instrumentation program. The spectrometer will allow students and faculty to study cells by comparing the protein makeup of normal and abnormal cells to better understand the body and how it works. 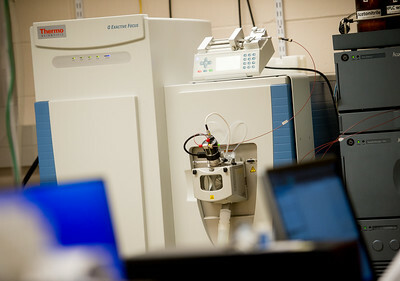 Photo: http://photos.indstate.edu/Other/Media-Services/Media-Sciences/Mass-Spectrometer-training/i-mbDvjZD/0/S/05_11_16_spectrometer-2118-S.jpg - Indiana State's new high-resolution liquid chromatograph-mass spectrometer will allow students and faculty to study cells by comparing the protein makeup of normal and abnormal cells to better understand the body and how it works. Funded with a more than $236,000 grant from the National Science Foundation's Major Research Instrumentation program, the spectrometer will allow students and faculty to study cells by comparing the protein makeup of normal and abnormal cells to better understand the body and how it works. 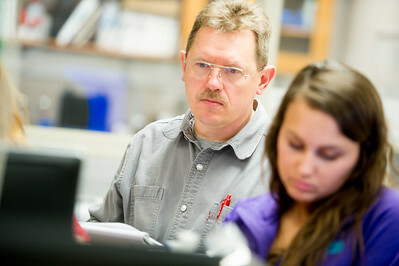 Photo: http://photos.indstate.edu/Other/Media-Services/Media-Sciences/Mass-Spectrometer-training/i-Wf5p32t/0/S/05_11_16_spectrometer-2166-S.jpg - Richard Fitch, professor of chemistry at Indiana State University, received a grant for more than $236,000 from the National Science Foundation's Major Research Instrumentation program to fund the purchase a high-resolution liquid chromatograph-mass spectrometer that will aid in undergraduate research and better prepare biology and chemistry for graduate school and careers. Science faculty have undergone two trainings to learn to use the deivce to aid in undergraduate research. Richard Fitch, professor of chemistry, received a more than $236,000 grant from the National Science Foundation's Major Research Instrumentation program to purchase a high-resolution liquid chromatograph-mass spectrometer for research.